Social Security Disability – Stephen Guillette & Associates P.C. If you work long enough at a job, which is covered under the provisions of the Social Security Act, and become disabled, you are probably eligible for Social Security Disability benefits. According to the Social Security Administration, a “disability” can be physical, or emotional, or some combination of both. In order to win benefits, you must have a disability severe enough to keep you from working in any regular paying job for at least 12 consecutive months. The test for eligibility for Social Security Disability benefits is not whether you can go back to a job you have lost. It is not whether you have been able to find a job recently. The test is whether you are physically and emotionally CAPABLE of doing a job that is generally available in the national economy. Furthermore, to obtain Social Security Disability benefits, you must have a doctor state that you are disabled. Your doctor’s opinion should be supported by clinical findings and/or laboratory findings. Unfortunately, many genuinely disabling conditions are difficult to diagnose by objective testing. In cases like that, it is up to us to present your doctor’s reports properly, and to convince the government that you deserve your Social Security Disability benefits. By law, anyone may file for his or her own Social Security Disability benefits, but statistics clearly show that claimants who are represented by a lawyer wins their Social Security Disability benefits much more often than those who apply on their own. The government makes the process very difficult. Waiting lines are long. Forms are complicated. Social Security Disability Benefits are often denied to people who have legitimate Disability claims. As a result, many people who apply for Social Security Disability Benefits on their own become discouraged and intimidated, so they simply back off, give up, and go away even when they are genuinely entitled to their Social Security Disability benefits. At Guillette and Associates, P.C., we do not let the government understaffing disrupt our clients. We are always active, aggressive advocates for our clients. It is a tough job, but we have been doing it for a successfully for years. An injured person may be eligible for Social Security Disability Benefits if they are unable to engage in any substantial gainful activity because of a medically determinable physical or mental condition which has lasted, or expected to last, for a continuous period of not less than 12 months, or result in death. To meet this condition, an individual must have physical impairments of such severity that they are not only unable to engage in their previous work, but cannot, considering their age, education, and prior work experience, engage in any other type of substantial work which exists in significant numbers in the national economy. To be eligible for Title II Disability Benefits, you must have worked five out of the 10 years before becoming disabled. For individuals under age 31, the requirements for determining eligibility are a little different because they have not had enough time to work to meet the quarterly requirements. 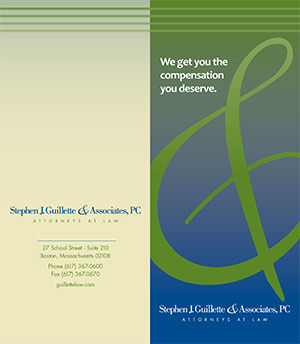 Attorney Stephen J. Guillette is an active member of the American Bar Association, the Boston Bar Association, and the Massachusetts Academy of Trial Attorneys. His practice focuses on personal injury and social security disability law. Think twice before you post to social media.